This is not a walk but a fantastic day out. The map is of the area only. Dorset is a county in the South West of England on the English Channel coast and borders with Devon to the west, Somerset to the north-west, Wiltshire to the north-east and Hampshire to the east. Dorset’s coast line, with some of Britain’s finest sandy beaches, stretches for about 90 miles from Lyme Regis in the west to Bournemouth in the east. Dorset has a varied landscape featuring broad elevated chalk downs, steep limestone ridges and low lying clay valleys. Over half of the county is designated as an Area of Outstanding Natural Beauty and three quarters of its coast line is a World Heritage Site. The heritage coast line, also part of the Jurassic Coast, begins in Poole Harbour and includes the Purbeck coastline which is the site of special nature reserves and marine parks. Travelling westwards to the coast line features some spectacular landforms such as the Isle of Portland, Lulworth Cove, Durdle Door and Chesil Beach which is a barren pebbled beach stretching 15½ miles from Weymouth to Bridport. Due to Dorset’s position on the coast and being the third most southerly county in the UK it has a climate of warm summers and mild winters. Behind the coastline lies a county rich in archaeology, unspoilt rural villages and countryside and a history from before the Roman times. The centre of Dorset is chalk downland with extensive rivers and streams. The north of Dorset is dominated by a plain known as the Blackmore Vale. The west of Dorset is a more hilly area with a rich landscape of woodland and small trees. The east of Dorset is mostly of low lying land with extensive heathlands most of which have SSSI status. To the south-east lie the Dorset Downs and Cranborne Chase of which both are Areas of Outstanding Natural Beauty. The Downs provide panoramic views of the Isle of Wight, the Purbeck Hills in the south and the Mendips in the north and are a great place for walking, riding or picnicking and admiring the views from one of the many grassy areas. Cranborne Chase was formerly a royal hunting forest and has a history of smuggling and deer poaching, the latter being punishable by death. Deer can often be seen grazing along with native flowers, flourishing butterflies and the rare Stone Curlew still visits the Chase every spring. The views from the rim of this great ridge of chalk are outstanding and on a fine day seven counties may be seen from the top of Bulbarrow. Agriculture was traditionally the major industry of Dorset but is now in decline and tourism has become increasingly important to the economy. There is so much to see and do in Dorset with several new leisure centres and two dry-ski slopes, there’s plenty of sporting activity including sailing, diving, wind-surfing, golf, cricket, tennis, bowls, football, rugby, walking, cycling, horse riding and rambling. There are also many museums, country houses and historic sites to visit. The Great Dorset Steam Fair also known as The National Heritage Show is an annual fair of steam powered vehicles and machinery attracting around 200,000 visitors. Traditionally this fair is held at the village of Tarrant Hinton near Blandford Forum in the heart of the beautiful Dorset countryside. It is a five day event starting on the Wednesday after the August Bank Holiday and boasts the largest collection of steam and vintage equipment to be seen anywhere in the world and also the biggest gathering of fairground organs in the UK. It was established in 1969 by Michael Oliver and for 15 years the steam fair, then known as Stourpaine Steam Fair, was held at Stourpaine Bushes. In 1985 it temporarily moved to nearby Everley Hill, following a land dispute. Access for large crowds was difficult at Everley Hill so in 1988 it moved to its now permanent place, covering 600 acres, at Tarrant Hinton where access has vastly improved. Michael Oliver died in 2009 and the show is now run by his son Martin. Most of the exhibits are traction engines, tractors and farm machinery, but there are also sections for classic cars and commercial vehicles, working shire horses, rustic crafts, bygones displays and much more. There are also 800 trade stalls, a market, autojumble, live music and a funfair, some of which are powered by the steam engines. 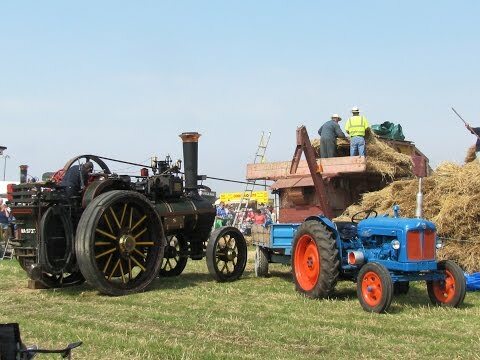 A speciality of the show is the display of traction engines and steam rollers performing the work for which they were designed including heavy haulage, threshing, sawing logs, ploughing and road making. The main arena of the show is situated on the slope of a hill to allow both steam and internal combustion powered machinery to demonstrate their capacity for heavy load hauling. 2008 saw the start of the Dorset Sound Festival, a music event that is held alongside the main fair, designed to entertain a wide variety of musical tastes. It has five stages, the Main Stage, Real Ale Stage, Folk Stage, Country and Western Marquee and the Black Bull Marquee. In 2009 the Main Stage was changed from being in a marquee to an outdoor concert stage this requires a concert ticket to be purchased unlike the other marquees that are free to visitors of the fair. It was also the start of a new event called Steam Sounds that showcases unsigned local artists on the outdoor stage. So whether you are looking for an excellent fun and action packed family day out or take in the full five days by camping on site there is something for everyone, why not give it a try. Tarrant Hinton, 3 miles north of Blandford Forum in Dorset. Admission fee payable on entry or tickets are available from tourist information centres across Dorset. From the M4 take junction 13 and head on the A34 (dual carriageway) past Newbury and Whitchurch. Then at a main roundabout take the third exit onto the A303 (dual carriageway) to Andover. After passing Andover continue on the A303 then take the A338 at a roundabout to Salisbury. Or take the A343 and A30. Then continue through Salisbury on the A30 and the A36, there are a number of roundabouts, then onto the A354 towards Blandford Forum. Follow the A354 for approx 17.5 miles. You will see the site of the steam fair at Tarrant Hinton before you get there. Free parking in the adjacent fields with ushers. There are also parking areas for disabled visitors. Direct bus routes are available from Weymouth, Dorchester and Salisbury. There are many portable toilets and for refreshments there are many food stalls.